An excellent upgrade from the stock unit, the Street Clutch far exceeds OE specifications in material, construction and performance. Light pedal pressure and quick release make this diaphragm clutch the most popular choice for today's street driven vehicles. Available for most GM applications. 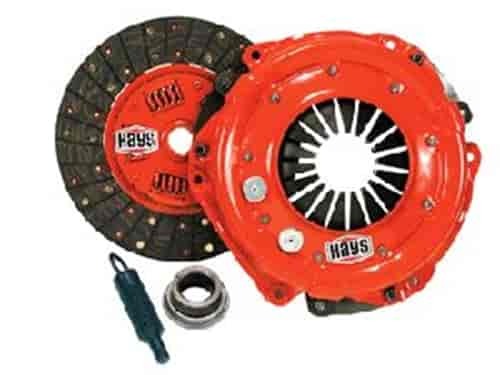 Hays street clutch discs are designed to provide clean, smooth engagement and provide a significant performance increase without sacrificing streetability. These discs feature organic friction material that is riveted to a Marcel* backing, and a sprung center hub to absorb driveline torque, eliminating shock and vibration to ensure chatter-free engagement. Engineered & built as a matched assembly, each kit includes pressure plate, clutch disc, throwout bearing, alignment tool, and Ultra-Seal pressure plate bolts. Expect excellent performance, durability & dependability from Hays. Will this work on my 1976 Pontiac Trans Am ? Yes, depending on the flywheel and transmission being used.